Navigate to the Harver marketplace, drag and drop the SJT module into your hiring flow and you’re off! Add text, video/images and questions to construct a life-like SJT. Our consultants will guide you through the setup, so your SJT’s will be up and running in no time. Give your applicants a virtual first day on the job. Situational judgment tests present your applicants with realistic, hypothetical scenarios that may occur on the job. In short, candidates get a virtual first day on the job. This way, you know if their responses align with your organization’s goals, preferences and culture. 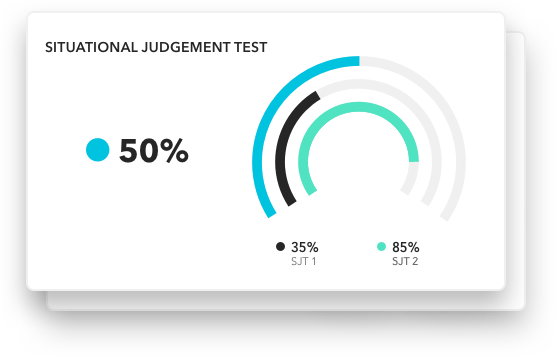 Harver’s AI algorithm scores candidates based on your benchmarks. Harver’s in-app algorithm scores candidates based on your company-specific benchmarks. Add a variety of assessment modules to get a detailed overview of a candidate’s fit to your organization.